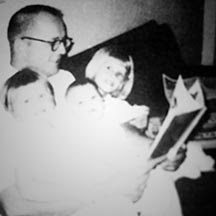 Dad reading to us, pre-James Patterson. My father, who passed away more than a year ago, used to read James Patterson novels. Apparently, he was not alone. I read the VanityFair profile on Patterson in its January 2015 issue. It contains the statistic that one of every twenty-six books of hardback fiction sold holds his byline. According to the article, his books alone provide his publisher with 30 percent of its total revenues. I've read a couple of his books through the years, but I've never purchased one. I used to borrow them from my father. I guess Patterson hasn't been missing my father's purchases too much. Patterson's ability to be so prolific is amazing. He balances dozens of his manuscripts at one time. The article does explain how he manages. (Hint: He has help.) The mega-selling author's idea of slowing down in his golden years--a few books a year--sounds fabulous to me for my middle-aged ones. The article is worth reading for so many reason, including learning how Patterson's managed to extend his brand. And capture readers in other age groups. I was intrigued to read how extensive his outlines are before the writing of his book--upwards of 80 pages. I love outlining books. Reading about his outlining as one way he is able to produce so much was comforting. Too often I am caught up in writing a story and its shape is rarely as pleasing as those I outline first, kind of like decorating a Christmas tree before securing its base. From now on, I will outline everything. I know I will never reach the heights of Patterson's prolific abilities. Long ago he decide to be a successful genre writer. For now, I am happy to be a writer who outlines. I wonder what kind of a pen he uses to write his best sellers...? Watch out publishing world! Do you know about any "secrets" of a popular or successful writer? What do they do and do you try to emulate it or does it interfere with your projects? Elizabeth King Humphrey is a writer, editor, and teacher. Her free guide, Harmonizing: Find and Communicate to Your Audience, helps health and wellness professionals communicate with their potential clients. When I should have been working on my blog post, I was perusing The Chicago Manual Online Favorite Things 2014 list.